Timeline 3D v3 and Easy Timeline for Mac are not compatible with Yosemite OS X 10.10. I built the core functionality of these apps 6-7 years ago on features of the operating system that are no longer supported by Apple. I will be discontinuing Easy Timeline from the App Store immediately. Timeline 3D v3 for Mac will continue to sell for those customers running OS X 10.6—10.9. If you are interested in running Apple's beta of Yosemite, please be aware that there is not yet a version of Timeline 3D that will run on it. My suggestion is to use our iOS app until we are able to ship a new OS X application (more info on that below). For several years, I have been anticipating these changes and have been developing technologies to support a transition. My goal for Timeline 3D is to allow a seamless experience across your Mac, iPhone, and iPad. I was pleased to see Apple reveal a similar vision for their platforms at this year’s WWDC. Many of the next generation features are shipping in the iOS app already and will be coming to a brand new OS X version of Timeline 3D over the next few months. This strategy has many benefits. Speed and Stability — Build on modern OS X frameworks and technologies. Retina display support for 3D presentations. Better animations and lighting in 3D timelines. Simplicity — No more tweaking fonts and image sizes to get a timeline to fit on a page. Continuity Features — Seamlessly move between Apple devices without loosing your place. App Store Distribution — Timeline 3D for OS X is coming to the App Store! Movie Export — Render HD movies of your 3D timeline. Please note that this ground-up redesign means that some features that have been a part of Timeline 3D for Mac will not be available immediately on the new version, for example, event rows and event colors. As I bring new features to Timeline 3D, they will be added to both platforms at the same time whenever it makes sense to do so. Timeline 3D for OS X will support OS X 10.10 and above. The new Timeline 3D for iOS will support iOS 8 and above. I expect to launch the new versions soon after Apple officially launches their new operating systems later this year. Timeline 3D is going freemium. For free, anyone will be able to download Timeline 3D for OS X or iOS, make and edit timelines, and present them in 3D. You also will be able to sync timelines over iCloud and share timeline documents using AirDrop or Dropbox. There is no time limit and no limits to the number of timelines or events that you can create and present. If you are a regular user of Timeline 3D, there will be an option to purchase unlimited exports, in which case the app will never present an in-app purchase option to you again. If you prefer an à la carte option, then exporting your timeline will require an in-app purchase. There will be a fee each time you print or export a PDF, PowerPoint slideshow, Keynote slideshow, HD Movie, or WebGL website. For example, if you use the timeline occasionally for a homework project, the software should be much less expensive for you than it is now. The new pricing model is designed to allow people to use the core features of Timeline 3D without paying (there are no free trials in the App Store). It also allows schools to install a usable version of Timeline 3D on every iPad and Mac for free. It allows current customers to make the switch without paying to gain access to their existing timelines, and it enables you to send your timeline document to someone who does not yet own the software without requiring them to purchase. I am excited about the future of Timeline 3D. The work I am doing now builds on over 10 years of experience with timeline software and thousands of support conversations. I am also a bit nervous, because I know that it may be a bumpy few months during the transition for some of you. I am committed to making the transition as fair and as painless as possible for existing customers. If you have any questions, please contact me at support@beedocs.com. To stay informed of betas and launches, please subscribe to this blog and connect to our twitter account. I hope it all works out for you. I'll be buying the "unlimited" version as soon as it comes out :-). and what about the iBooks Author Widget export ? Gone forever ? Yeah, I'll buy the "unlimited" edition, too. Although I have no immediate use in sight, I like this little app. Thank you Planeten and MimarSinan! 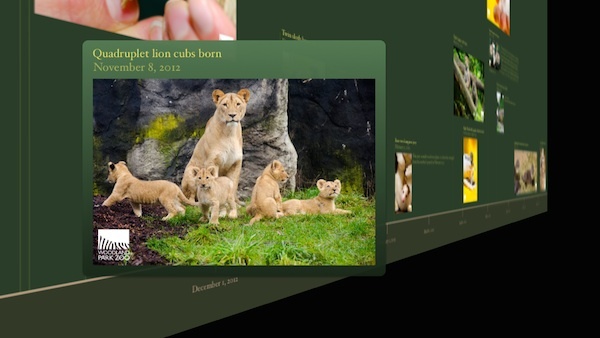 Aimline - Timeline 3D will still support movies, images, and slideshows in iBooks Author. Yes, the current "Export as iBooks Widget" feature will go away or change in the next version. I'll have to experiment with the new WebGL export feature to see if that is possible to use within iBooks. iOS 8 supports WebGL in Safari, so it might be possible. BTW, Did you see my video showing the different ways that timelines can be embedded? Timeline 3D is a very useful and original software. I use it for many projects and wish a bright future to your company. Nevertheless, I am concerned about the future business model. In fact, I don't see the model to pay each time I export a work that is the result of my intellectual work (IP). As an example, if I write a document or a presentation in a text or a presentation editor, I can export in any format my work without paying an extra fee. Even if we have an option to pay a fee for an unlimited export, which is the equivalent of purchase a licence of the software, I am concern about the structure of this pricing. In fact, changing the pricing structure sounds to me a way to maybe higher the price of the licence that is already high in my opinion. Could you please let us know what is the price you expect to charge for unlimited download ? Thank you very much. Stéphane, I have not finalized the pricing yet. I want to wait until I write the new software before deciding. The iOS version will probably increase in price for the unlimited version but will be a free upgrade for those who already purchased Timeline 3D for iOS. The Mac version of Timeline 3D has had two paid upgrades over the last 10 years, this will be the third. It is likely that the next version will be priced similar to those upgrade prices (which were $25 each). Thank you so much for your answer, It seems very reasonable and I wish you a lot of new download because Timeline 3D is a real innovative and useful software. I wish you will be able to enlarge considerably the users community. I'm not necessarily an early adopter, per se, but I will be upgrading to Yosemite (10.10) as soon as it is released and available on my Mac. In shopping around for a timeline application, I felt like yours was going to be the best choice, but am a little concerned about getting into an application, putting all of my stuff into it, upgrading to Yosemite when it's released, and then losing access to my information. As a prospective customer, I'm interested in hearing your thoughts. The new version of Timeline 3D will open your existing timeline files, so there is no need to worry that the work you are doing will be lost. Cheers! It has also placed me in a quandary. I was about to buy the OS X and iOS versions of Timeline 3D (I'm planning a book and want to get the timings sorted). However, it seems like I would be spending approx $70 only for the apps to be replaced in the next couple of months and then I'd be on another buying round. Have you any thoughts on the best approach? I haven't downloaded the trial, would that keep me going until the new version; I'd be happy to buy the iOS version in the short term if that was all I had to pay for. Thank you for your upfront announcement on this as I would have been frustrated to have spent the money and then discovered there was a whole new pricing model. Thank you for your comment. If you purchase Timeline 3D for iOS now, it will be a free upgrade to the new version when it is release. On the Mac version, it is true that the software is $65 now and will be an additional (smaller) charge to purchase the Yosemite version when it comes out. That is why I am giving the advanced notice. I think it will be a good value even if you buy the software now and then pay to upgrade later this year. However, I understand that some people will choose to wait until the new version is ready to go. As a matter of curiosity, what are the MacOSX features that Apple no longer supports? Bozo - Two of the biggest are Garbage Collected memory and Quartz Composer. The majority of the code in Timeline 3D depends on at least one of those technologies. The current application won't even compile with the latest versions of Xcode (and older versions of Xcode won't run on current OS X systems). I believe Quartz Composer still exists though it hasn't been updated in years (for example, it doesn't support retina displays). When I won an Apple Design Award, the said this was one of the most complex usages of Quartz Composer that they had seen. It allowed an amazing new feature, but as QC has fallen out of favor, it has become a liability. There are also features that I am choosing to move away from in order to support things like iCloud. For example, the Core Data XML format I'm using on OS X is not available on iOS. Also, Core Data Document syncing is not supported in iCloud. Actually, the current Timeline 3D does launch in Yosemite though it is buggy. I am unable to fix those bugs since I can't compile the code with my current Macs. I'm not complaining. One of the great things about Apple is that they focus on what is new and are not afraid to cut ties with older technologies that might slow them down. However, it does force a major rewrite for me. Can I export to iMovie from the iPad app ?